It feels like forever since my last post – I’ve been busy busy! I have finals this week, so I am beyond ready for summer to begin. I also found my own apartment – yay! However, I move in this weekend, so I have been scrambling to find time to both study and pack; not easy. Therefore I have been relying on salads and freezer meals recently…a pat on the back to me for, at some point, making extra food and stashing it in the freezer! However, at the beginning of last week I made this yummy shrimp parm recipe. 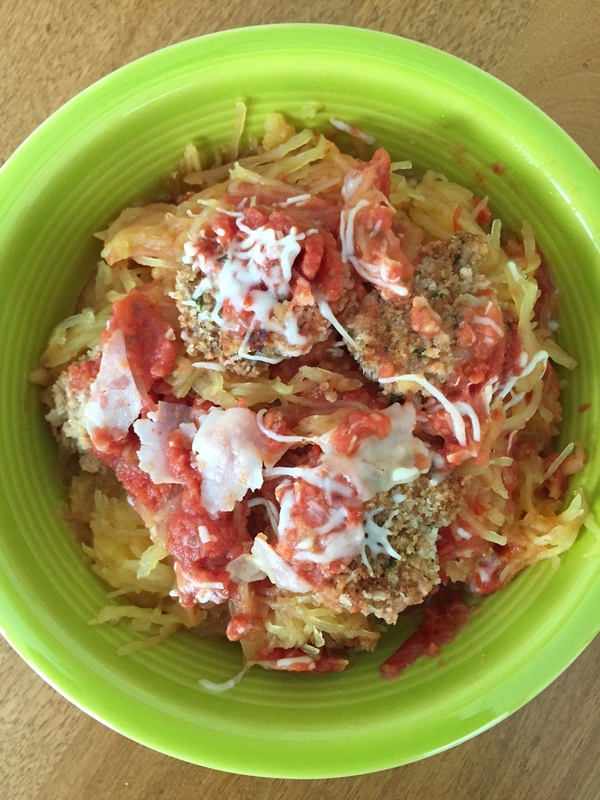 Another delicious and easy recipe from Gina at Skinnytaste! 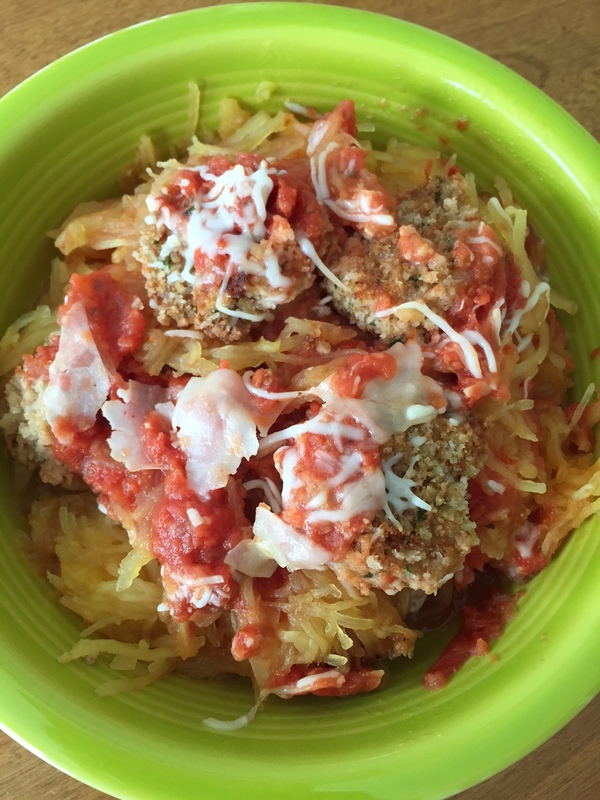 I decided to make spaghetti squash to go with it; however, she used zucchini noodles, or you could use your favorite pasta! I doubled the original recipe so I would have enough for the week. I also added pesto to a few of the leftovers and it was really good, so I may add that next time when I cook the sauce. My spaghetti squashes made a lot of cooked “spaghetti” so I made each serving of shrimp over 2 cups, which was very filling, but feel free to adjust that to your liking. Enjoy! 1.) 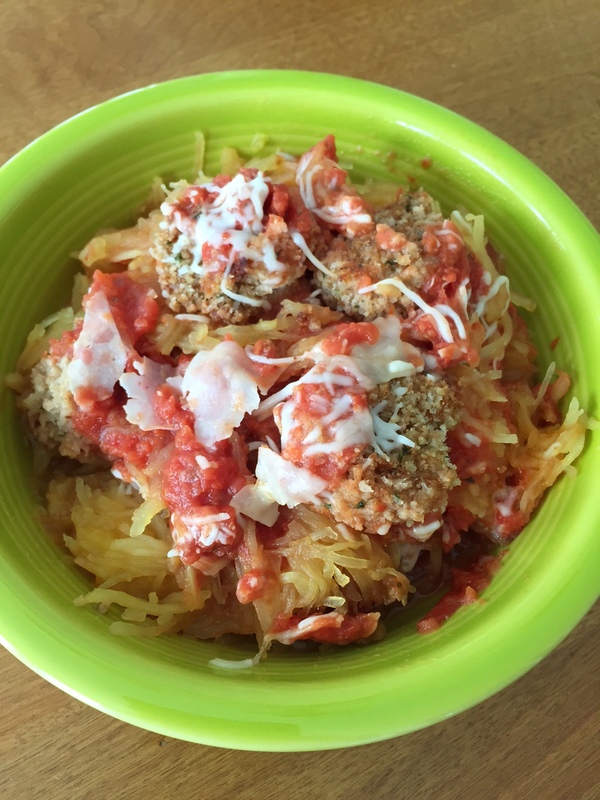 Prepare spaghetti squash – see here for instructions! 2.) Preheat oven to 450 F. Spray a glass baking dish or cookie sheet with oil. 3.) In a small bowl, whisk the egg. 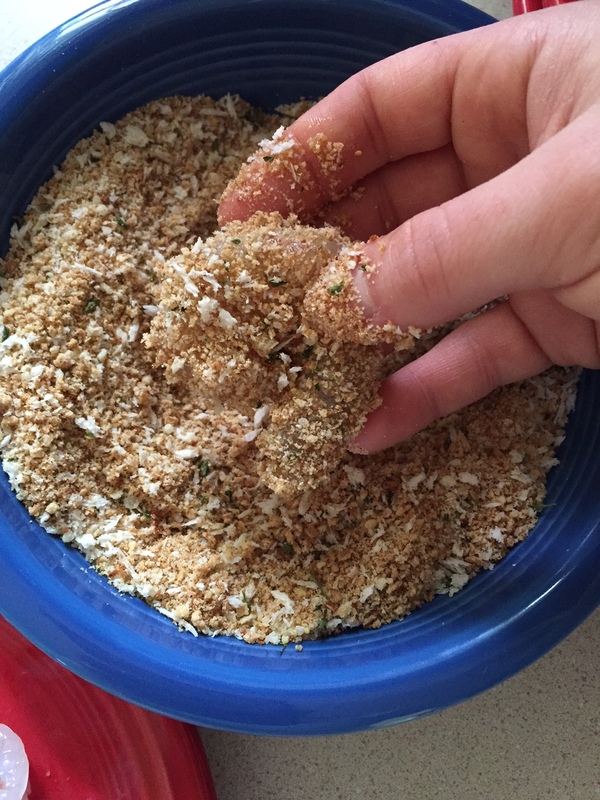 In another bowl, mix the breadcrumbs, panko, and grated parmesan. 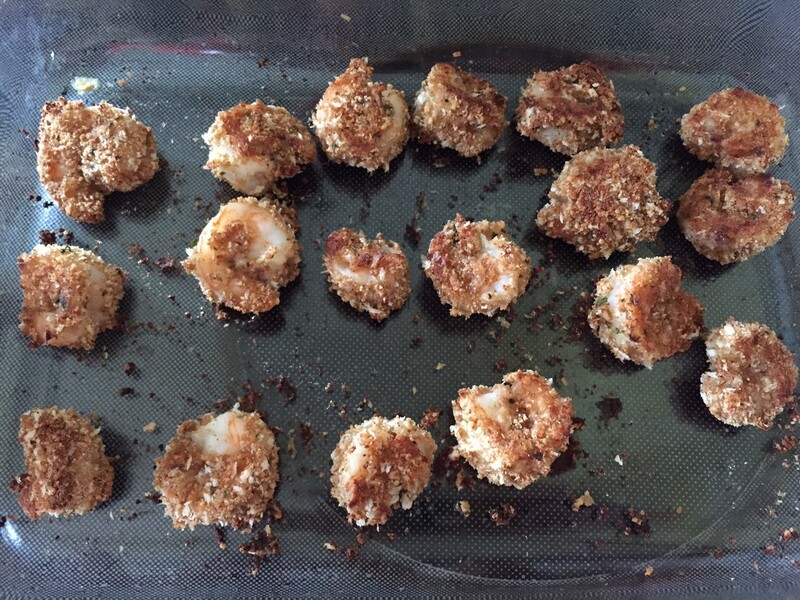 Dry the shrimp, then dip each one in egg and roll in breadcrumb mixture until fully coated. 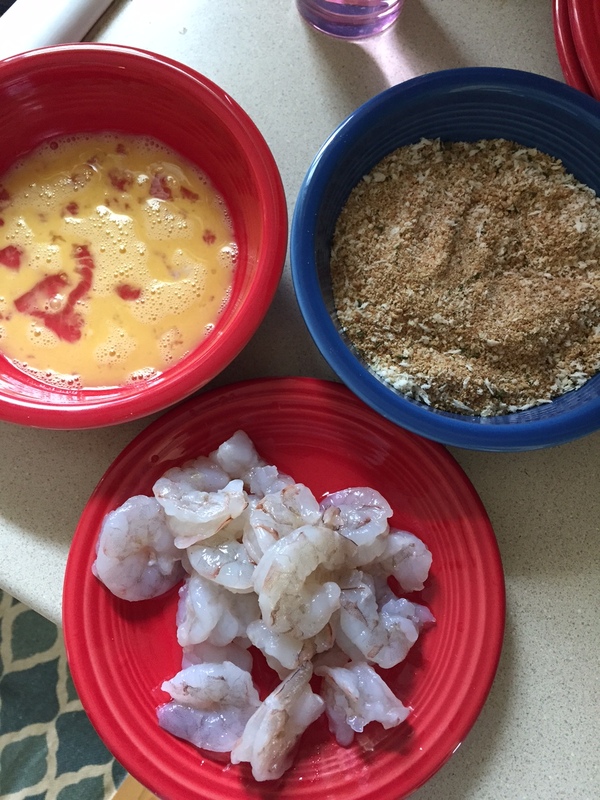 Place shrimp on baking dish and spray them with oil. 4.) 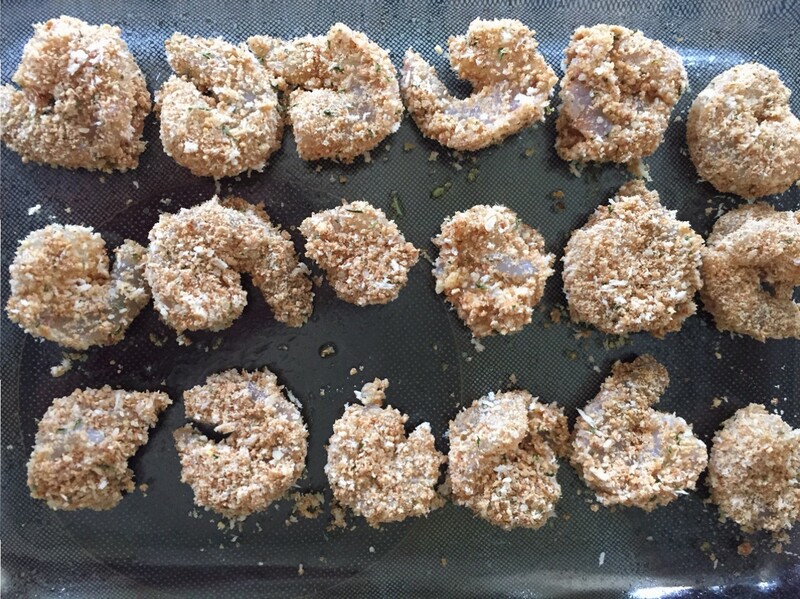 Bake until golden brown, crispy, and cooked through, about 20 minutes, turning the shrimp over about halfway through. 5.) While shrimp are cooking, heat the crushed tomatoes in a small saucepan over medium heat until bubbly. Add Italian seasoning and salt, to taste. 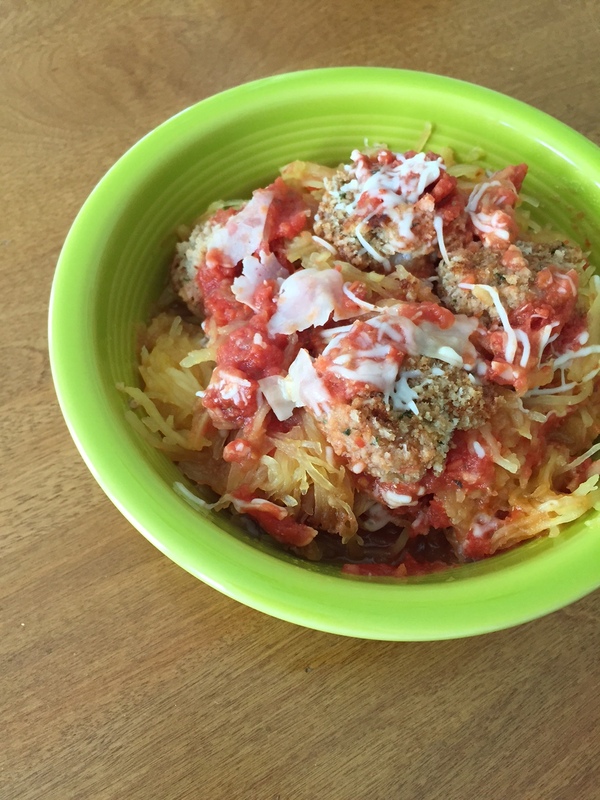 Once shrimp are done, serve over spaghetti squash and top with sauce, mozzarella, and shredded parmesan.